This page contains legacy information. Its content used to be part of the Assembly page dealing with installing hard drives. Because almost no one uses PATA hard drives anymore, the information here has been extracted and reassigned as a legacy page for historical purposes and for those few visitors who might actually need this information. "Classic" EIDE (PATA) drives used flat ribbon cables that were a pain to route in the case and sometimes blocked airflow. They're one of the reasons I don't miss PATA. There also were round PATA cables, which helped improve airflow, but which were heavy and bulky. Now we're ready to connect the data cables and power cables. Old-fashioned EIDE drives use either flat, ribbon cables, or the newer-style rounded cables. SATA drives use thinner, flexible cables that are easier to route through the case and that improve airflow. Enhanced PATA hard drive cables have 80 conductors and color-coded connectors. The black connector gets connected to the master drive (or the sole drive if the computer has only one drive), the gray to the slave drive (if any), and the blue to the motherboard. If the connectors are not color-coded, then check to make sure the cable has 80 conductors. It might be an older 40-conductor cable, which will drastically slow down hard drive transfer rates. Don't use it. If it's just an 80-conductor cable that's not color-coded, the off-center middle connector gets connected to the slave drive, the end connector closest to middle connector goes to the master, and the end connector farthest from the middle connector gets connected to the motherboard or controller card. 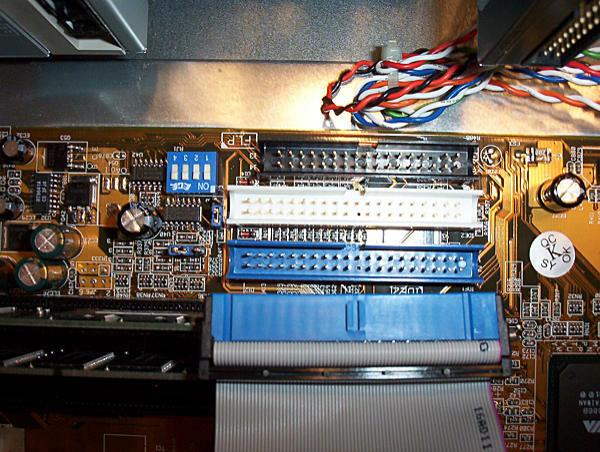 Most motherboards and PATA controllers have two IDE channels, the primary and the secondary, each of which can accommodate a master and a slave drive. The primary channel will be labeled EIDE (or PATA) 0 or 1. The secondary channel will be labeled one higher than the primary (1 if the primary is 0, or 2 if the primary is 1). If there are additional channels, they'll each be number one higher than the one above it in the hierarchy. The system drive (the drive the system will boot from) should always be the sole or master drive on the primary channel. If you have only two drives (for example, the system drive and an optical drive), then make the second drive the master on the secondary channel to avoid sharing throughput with the system drive. Each channel divides its throughput between the drives attached to it, so it's better to attach only one drive to each channel. If you have more than two drives, then the best way to configure them is to think about the least-likely scenario when one drive will be writing to the other, and put those two drives on the same channel, with the one that will be used more often as the master. So if you have two hard drives that you frequently move data between, and a DVD drive that you don't use very often, you might want to make the second hard drive the master on the second channel, and the DVD drive the slave on the second channel. You'll also have to set the jumpers on the drives to either Master, Slave, or CS (Cable Select). 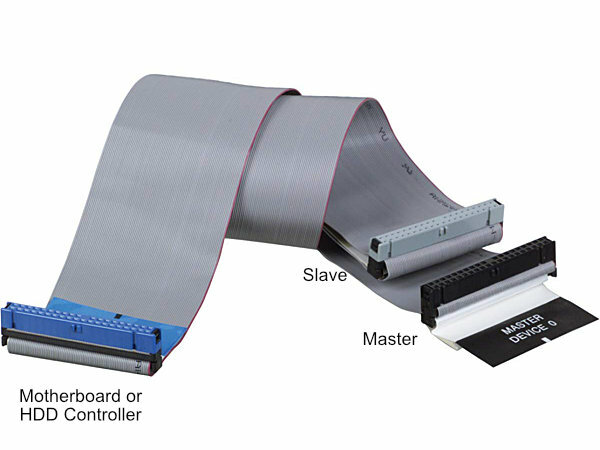 If you choose CS, the drive will be assigned as a master or slave depending on which connector on the ribbon cable it is attached to. This is the easiest way to do it and almost always works. Just remember to select CS for all the drives if you want to do it this way. You can read up here if you need more information about PATA hard drive jumper settings. You'll notice a colored stripe along one edge of the ribbon cable. This stripe must line up with pin Number 1 on both the IDE controller and the drive. If pin Number 1 is not clearly marked on the device itself, then look in the manual or instructions. (On hard drives, pin 1 usually -- but not always -- is the pin closest to the power connector.) Most EIDE drive cables also have little raised grooves that fit into a little notch on the connector to insure that they are attached properly. Attach the cables firmly, but gently, by pushing them straight into the connectors on the drives and the motherboard. Make sure that the pins line up before you push. If you break a pin, you will permanently ruin the drive or motherboard.